To help combat fattening food cravings, researchers from the University of South Florida recently conducted a study that found that surrounding yourself with the smells of fattening foods for at least two minutes is a great way for consumers to steer clear of the extra calories. Biswas and his team set out to discover how scent would effectively curb cravings, and they learned that the amount of time consumers are exposed to the smells is what matters most. The researchers conducted the first part of their experiment in a middle school cafeteria, where they injected scents of either pizza or apples through nebulizers that couldn’t be directly seen. The scents were filtered on alternating days, and the researchers took note of the students’ subsequent purchasing options depending on what scent was in the air. On days when the apple scent permeated the cafeteria, students were more likely to purchase unhealthy food and drinks, whereas on days when they smelled the pizza, they made healthier lunch choices. The researchers then replicated the study in a lab setting, switching the scents to filter either cookies or strawberries. After participants were exposed to the smells, they were asked which food they’d prefer: cookies or strawberries. Similar to their cafeteria test, the smell of the cookies helped participants make healthier choices, and the time they spent surrounded by the smell of the cookies mattered. 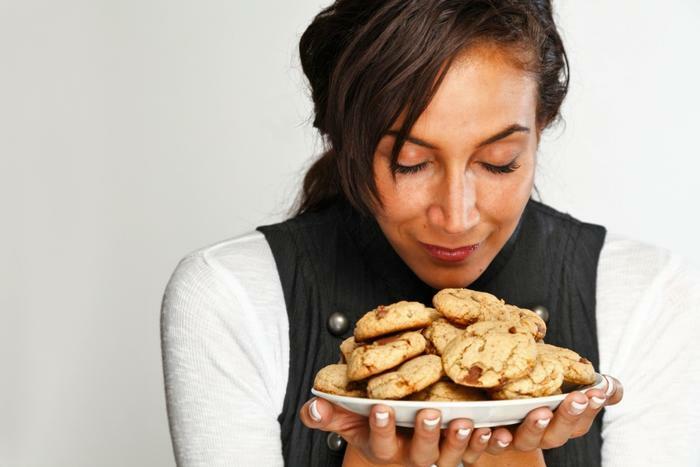 When participants had inhaled the cookie smell for two minutes or more, they were more likely to make healthier choices. When they spent less than 30 seconds with the cookie scent, they were more likely to choose the cookie. The researchers believe this works because the scent is tricking the brain into being satisfied by the food without the participants ever having to consume it. Biswas and his team join several other researchers of late who have looked into the best ways for consumers to fight their food cravings. A study at the end of last year looked at nearly 30 scientific studies to produce a comprehensive list of effective ways to kick cravings. Researchers found that losing weight can decrease cravings, while frequent exercise can increase cravings. Moreover, cutting out foods from your diet was found to work better than portion control, while certain prescription drugs were also found to help fight cravings. Additionally, a separate study found that withdrawal from junk food is similar to what addicts experience when they stop using drugs. For those whose diets consisted primarily of junk food, the symptoms were particularly strong, and many reported feeling fatigued, sad, and irritable. However, if consumers can get past the first five days, the symptoms reportedly decreased.